*Disclaimer* I have not been paid, nor have I received anything to review this book. 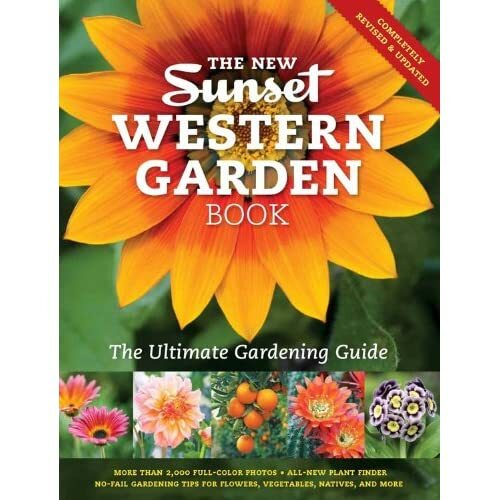 The ubiquitous Sunset Western Garden Book is a pretty substantial part of my every day life. It is THE reference book I use at work (I work in Landscape Architecture and I’m the go-to plant guru in my office) so when a new one is published I have to get it to stay on top of all the new plants that are in the trade. When the new one came out saying that it had 1,000 more plants in it than the last edition I knew I had to get it. They updated it by consulting with Landscape Architects, horticulturists, Cal Poly faculty (may Alma Mater) and UC Berkeley faculty. On top of that it now has photos! Photos! Like seriously, photos! The line drawings are great and I was super excited when the green and white line drawings were updated to color drawings, but now there are photos! I was too excited to think about anything else. And then I opened it. Let’s ignore how easily the cover creases and move on to the meat of the book. Glossy colorful pages beckoned me to keep turning pages. The plant finder section appeared to be longer, but was in fact substantially shorter. The lists are harder to read and there looks like there are less plants on the lists. Before the plants listed had lines separating them which made it easier to read. Those are gone. There are more groups to look under but they got rid of the most useful groups. Gone are the headings for Ornamental Grasses and Grasslike plants, Colorful Foliage, Perennials, Annuals, Garden Trees (which included evergreen and deciduous patio, medium and large trees broken out), Bulbs, Landscape Plants with Showy Flowers, Vines, Ferns, Palms and Cycads, and Plants for Rock Gardens. Instead I get groups like Plants for Moon Gardens. Seriously? I don’t feel that it’s a popular enough topic to get it’s own section while grasses get the shaft. And then I started to flip through the main part of the book. The pictures are nice but definitely lacking. It’s great to see what the flowers of a Pyrus calleryana look like up close but I want to know what the tree form looks like. At least with the hand drawings they included tree forms, which with this edition are severely lacking. Actually nearly all of the photos are focused on the showiest part of the plant and totally ignore the actual form. From this book, just looking at the photo doesn’t really tell you much about the plant. The most beautiful feature of a Mayten tree (Maytenus boaria) is it’s weeping form. Do they show that in the photo? Nope, just a closeup of the leaves. For the non-professional the book does hold some positives. They’ve brought back the cross referenced index for easily looking up plants by common name. They have also included a lot more edibles (even including a header in the plant finder). And it includes a great section in the back on pests and diseases with great color photos. In conclusion I think this is a better version for the at home gardener but if you’re a professional designer or landscape architect, don’t throw out your 8th edition. Great review, I might have to thumb through a copy just to see how the layout is with the new photos. I stopped actually using this book before the last edition. It’s a Western garden book, but their coverage of Western natives was absolutely lacking, so for me it wasn’t very useful here. However, for years in my previous gardens it really was very helpful, especially in regards to gardening in our diverse microclimates in the Bay Area (USDA Zone designations just don’t cut it here), and I agree that most generalist gardeners will still find it immensely useful. I recommended this book to my mother in AZ because I thought there was a great list of evergreen vines in the Plant Selection Guide. Imagine my frustration when she called me because the list was non-existent in the new edition! I sat and read off botanical names from my 8th Edition copy while she scrambled through the new Edition’s index page to highlight the names. I’m glad I kept my old book and will not be replacing it any time soon. The photos were enticing, but the loss of easily accessible information is a deal breaker.